Investigating Astronomy is a total astronomy teaching and learning package. Based around the innovative textbook Investigating Astronomy written by Timothy F. Slater, Inge Heyer, and Stephanie J. Slater, cleverly illustrated by Alex Richard of DarkHorse DesignWorks, the Investigating Astronomy Toolkit includes a colorful printed textbook, an interactive Kindle e-book, a theCN.com-based learning management website, and a frequently updated website including homework tasks and instructor resources. Investigating Astronomy - A Conceptual View of the Universe is a total astronomy teaching and learning package. Based around the innovative textbook Investigating Astronomy written by Timothy F. Slater, Inge Heyer, and Stephanie J. Slater, cleverly illustrated by Alex Richard of DarkHorse DesignWorks, the complete Investigating Astronomy Toolkit includes a colorful printed textbook, an interactive Kindle e-book, ready-to-go PPT slides, test-banks, a first-class online auto-graded homework system from ExpertTA, and a frequently updated website including homework tasks and classroom-ready instructor resources. This learning system leverages the latest results of cognitive sciences research on how students learn science. 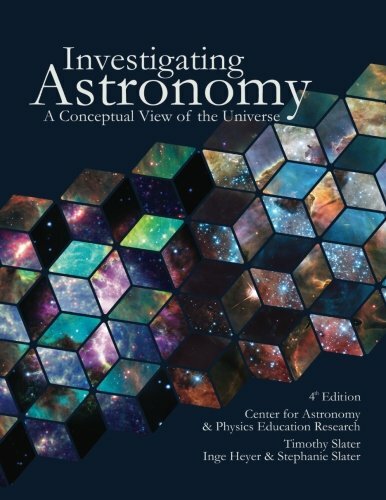 TEXTBOOK: ‘Investigating Astronomy: A Conceptual View of the Universe,’ now in its 4th edition, is an easy-to-read and understand conceptual survey of astronomy constructed on cutting-edge teaching and learning research that helps a wide diversity of students learn most efficiently. Cleverly illustrated by digital artist Alex Richard, this 400-page book is designed for the single-semester introductory survey course, and can work in other teaching situations as well. By producing the book ourselves, the book sells to the bookstore for only about $50, making it a highly cost-effective solution for your students. ACTIVE LEARNING ACTIVITIES: Accompanying Investigating Astronomy 4e is a newly available package of ‘Active Learning Tutorials for Astronomy & the Planetary Sciences.’ Each of the 60 included ACTIVE LEARNING TUTORIALs—or ALTs for short—takes into account and targets common misconceptions students have about astronomy and space science. The short ALTS—lasting just 5-7 minutes each--are designed to be easily implemented during class to help students deepen their understanding of challenging concepts across the breadth of everything you teach. The ALTs sell to your bookstore for just $14 and are plentiful enough to be used in nearly every class meeting to improve students’ learning. AUTOMATICALLY GRADED ONLINE HOMEWORK SYSTEM: Tightly matching every chapter in Investigating Astronomy 4e, we have partnered with ExpertTA to produce a low-cost, worry-free online astronomy homework system that simultaneously helps students engage continuously in the learning of astronomy while lightening the burdensome workload of busy teaching faculty. ExpertTA Investigating Astronomy masterfully handles all of your students technical questions so you do not have to worry about it yourself. Question formats include conceptual multiple-choice, drag-and-drop interactives, and short-answer—all for about $30 per student. The bottom line here is that with a dedicated team of passionate astronomy educators, we have constructed a a top-tier, first class learning system that is easy for you to implement and supports your students’ learning for less than $100 altogether. You can adopt any one of the three components separately or adopt all three – the choice is yours. In addition, you get all the 24/7 and 1-800 technical support your students need and all the behind-the-scenes teaching ancillaries you need, including ready-to-go test banks and classroom-ready PPT slides, to provide the best possible learning experience for your students. 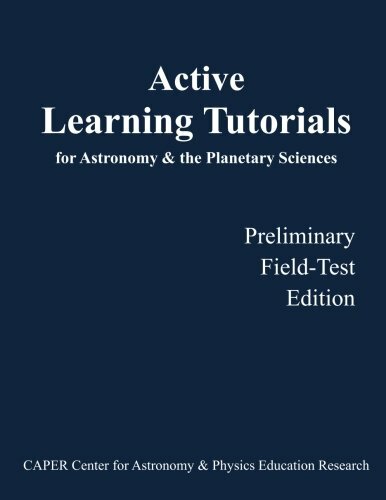 To have your bookstore order the most current print edition of Investigating Astronomy 4e textbook (ISBN 1978189516) and/or the Active Learning Tutorials (ISBN 1721633510), have your bookstore contact Pono Publishing at info@ponopubs.com or telephone (520)975-1373. Alternatively, you can always direct your students to Amazon to purchase these materials. To sign up your class for the ExpertTA Astronomy online-homework system simply visit http://theexpertta.com/investigatingastronomy/. SEE A FREE SAMPLE CHAPTER THIS INSTANT! Get a free sample KINDLE chapter of the 4th edition by visiting https://amzn.to/2tCWJfS and selecting "SEND ME A FREE SAMPLE" on the right hand side of the screen. Otherwise, contact Info@PonoPubs.com.